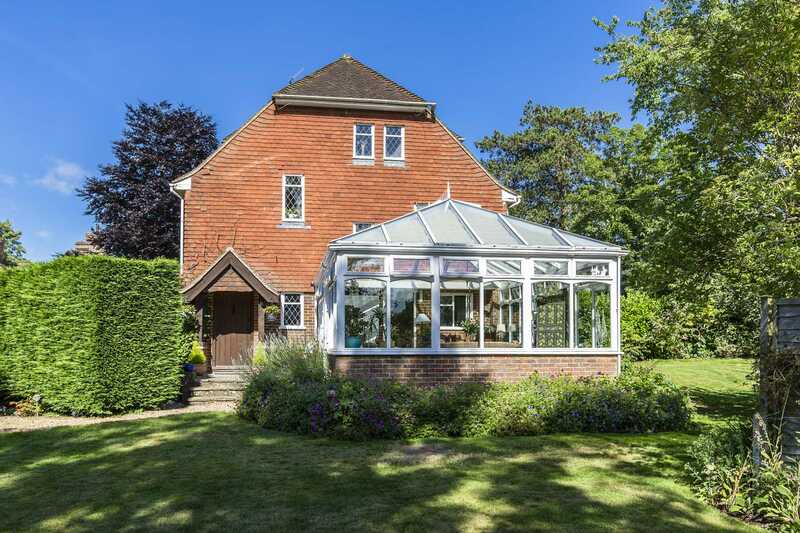 SOLD BY FLYING FISH PROPERTIES Tucked quietly down a private lane and nestled in the heart of its popular village setting, this pretty home oozes charm and character as soon as you approach. Its idyllic semi- rural position is surrounded by open countryside but it also presents a perfect dynamic of excellent schools, superb transport links and even a popular gastro pub on its doorstep. 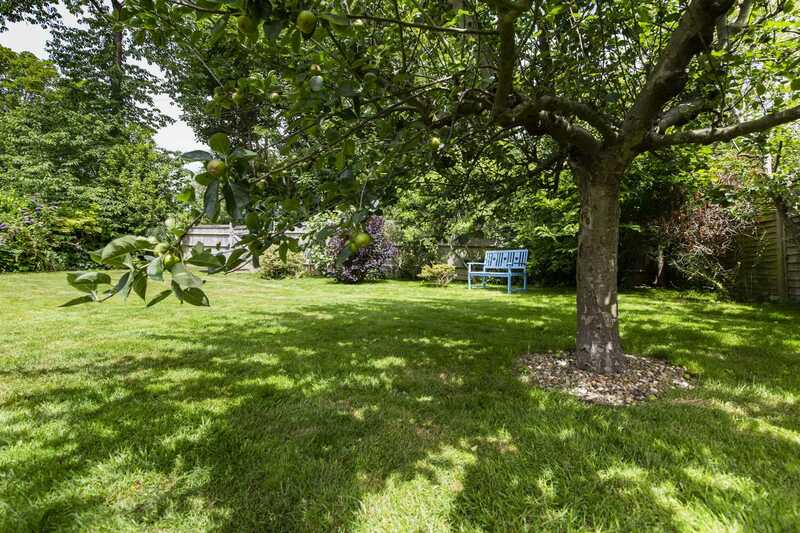 With a pretty cottage garden at the front the gardens lie predominantly to the side and rear of the house and are mainly laid to lawn with mature trees and shrubs providing a high degree of privacy. 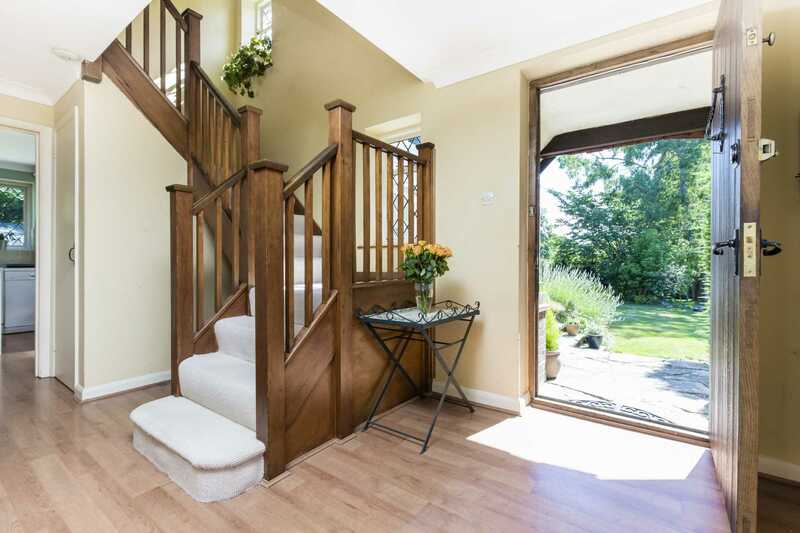 A winding pathway leads you from the spacious driveway to a canopied entrance doorway which opens into a bright and welcoming hallway. A leaded internal window teases you with glimpses of the delights of the sitting room behind which certainly does not disappoint. 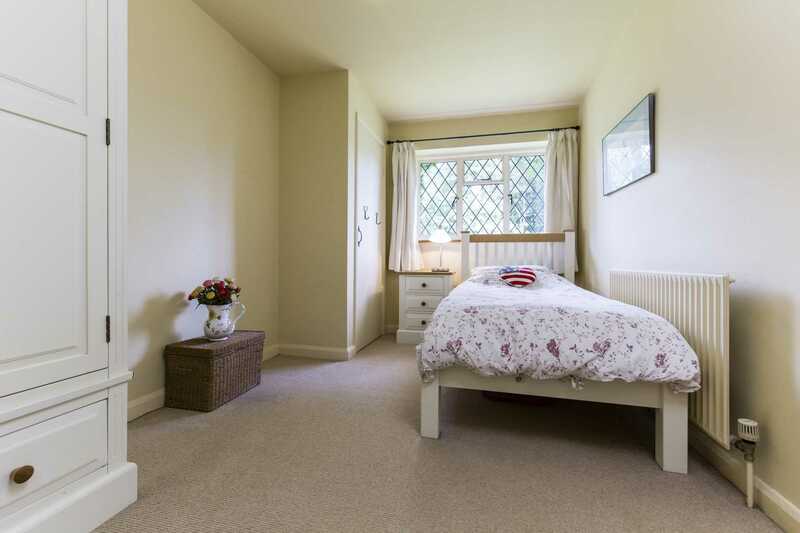 It is a spacious room with its beautiful leaded windows flooding the room with light and an open fireplace offering warmth in the colder months. 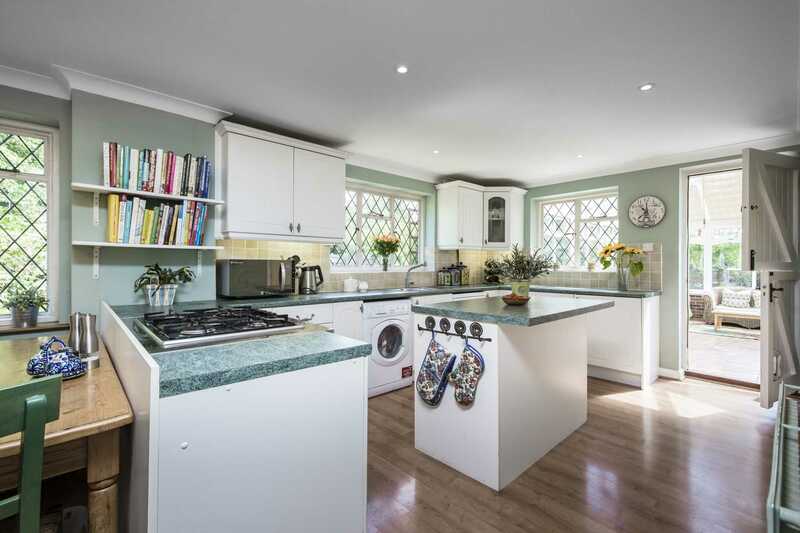 The kitchen/breakfast room is at the rear with its triple aspect leaded windows brightening the room and bringing views of the garden in. 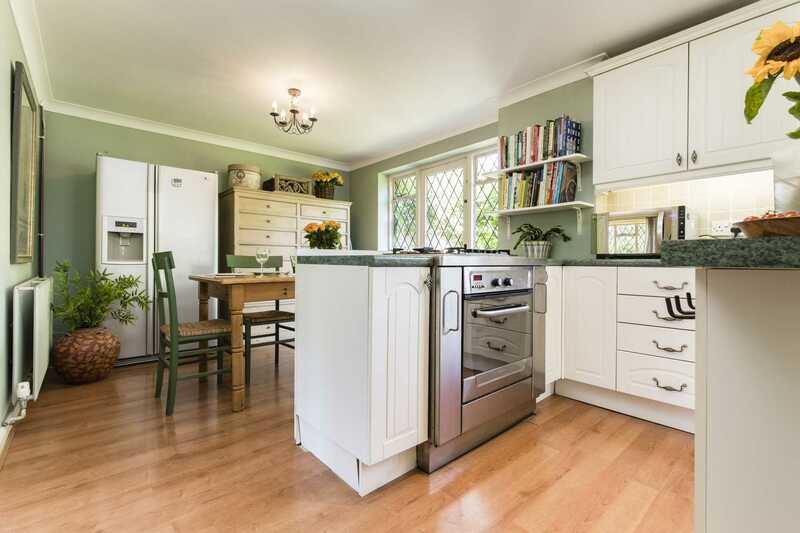 The kitchen`s country style cabinets provide ample storage space top and bottom with an expanse of worktops and a central island making it a chef`s dream. 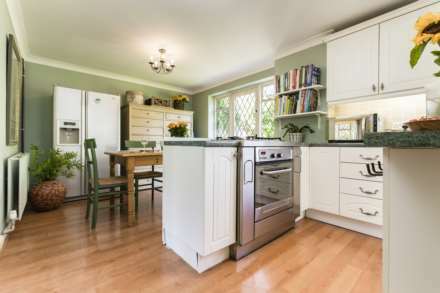 There are two integrated under counter fridges and plenty of space for additional appliances and a dining table and chairs. 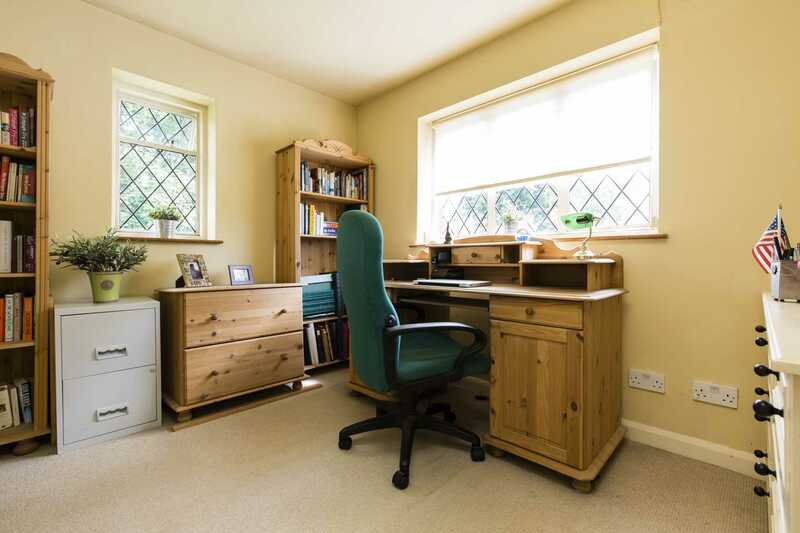 A stable door into the conservatory and another concealing a storage cupboard add to the country feel. 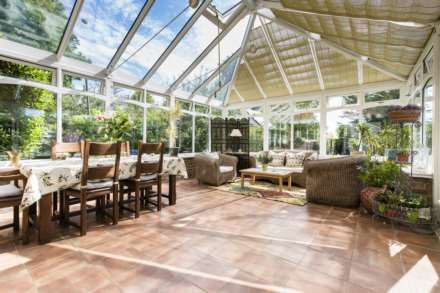 Next door the jewel in this home`s crown is the vast double-glazed conservatory that delivers versatile extra living space which could be used for anything such as your new dining room, a playroom for the children or somewhere to relax and look out into your garden. 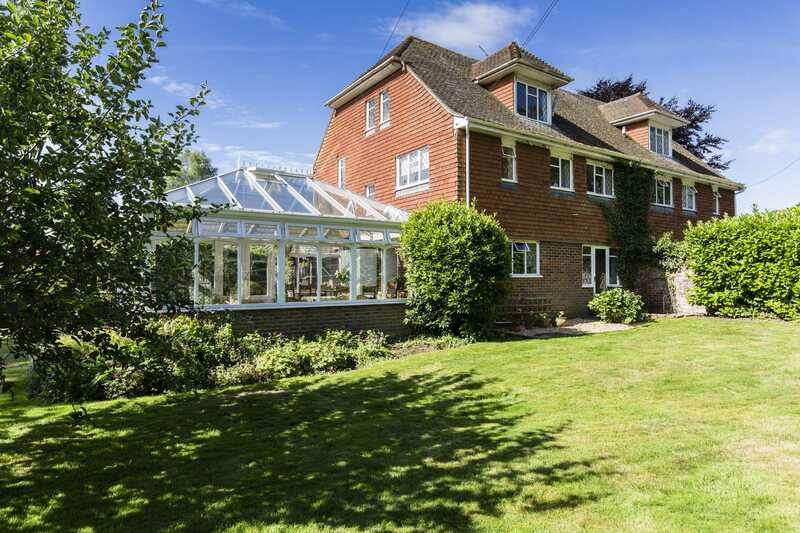 Climbing the stairs to the first floor there are three generously sized bedrooms, one with a large en-suite bathroom, all flooded with light from their pretty windows with leafy views. A separate shower room offers convenience for any visiting guests. 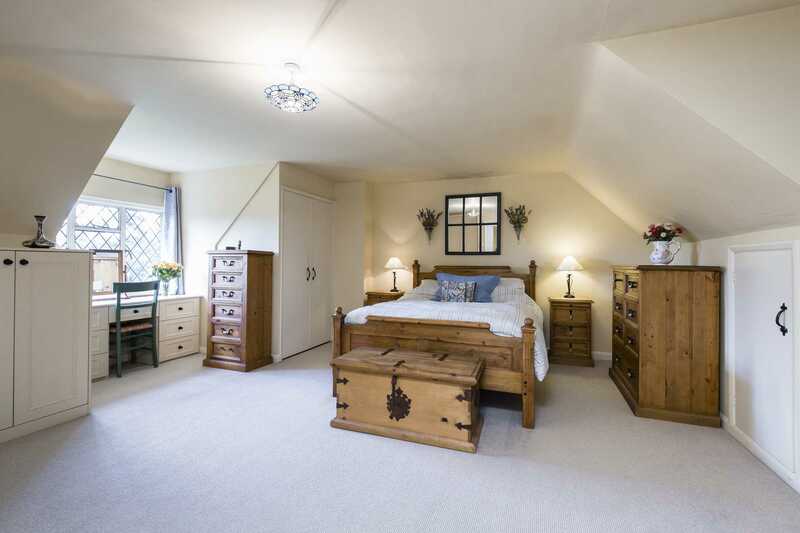 On the second floor, the large master bedroom has its own en-suite bathroom and fitted wardrobes a plenty complete with bespoke shoe storage and a dressing table placed under one of the room`s charming leaded windows. 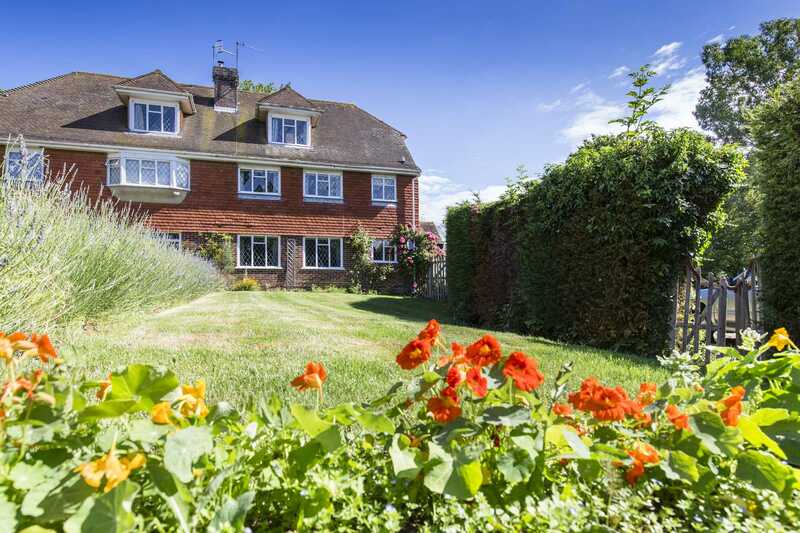 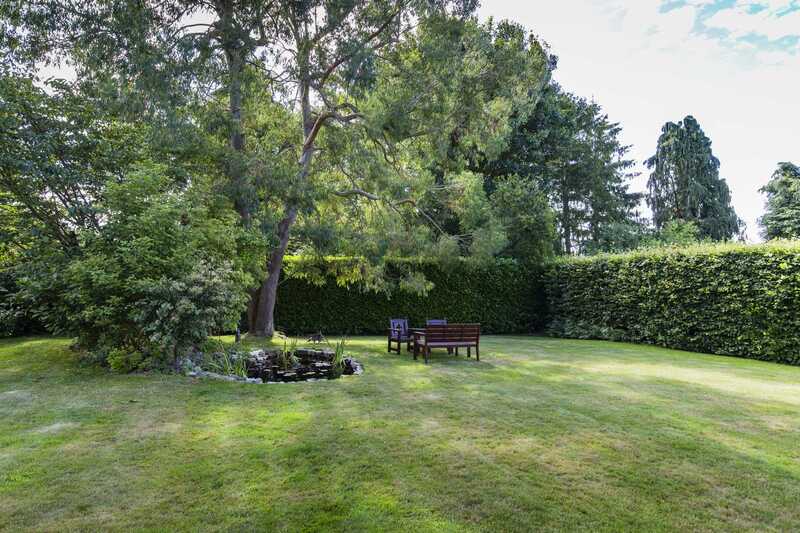 Pretty spacious gardens of approximately 1/3 of an acre lie to the front, side and rear of the house, safely self-contained for pets and children. They are mainly laid to lawn with mature trees and shrubs providing a high degree of privacy with a pond and vegetable garden fulfilling your every need. To the front, an off-road parking space large enough for several cars sits in front of a double detached garage with power and light. Owl Lodge is, as its name suggests, brimming with character with the current owners having sympathetically modernised the interior to create a spectacular family home. 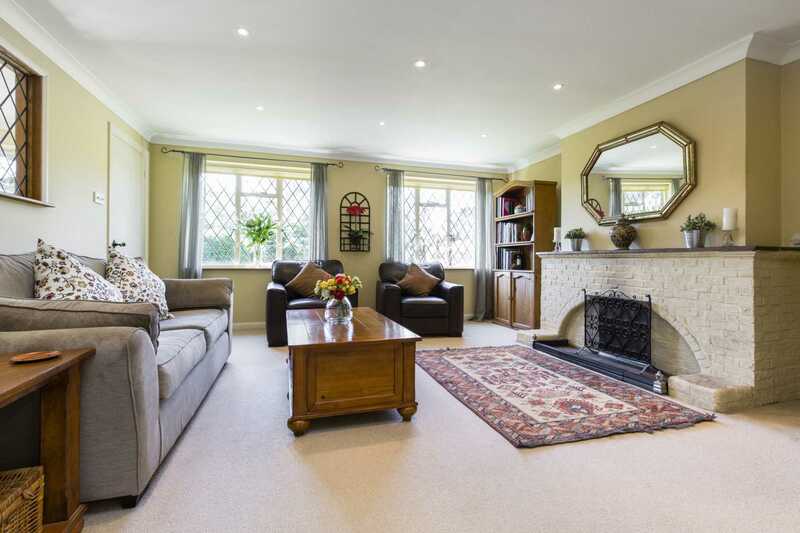 Sitting Room: 15`6 x 15`5` Front aspect leaded windows overlooking the front garden and radiator. 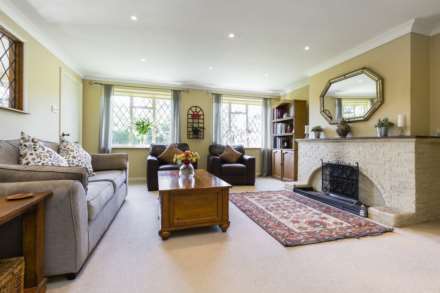 A painted brick enclosed open fireplace with tiled mantle and hearth adds character and warmth to this relaxing space. 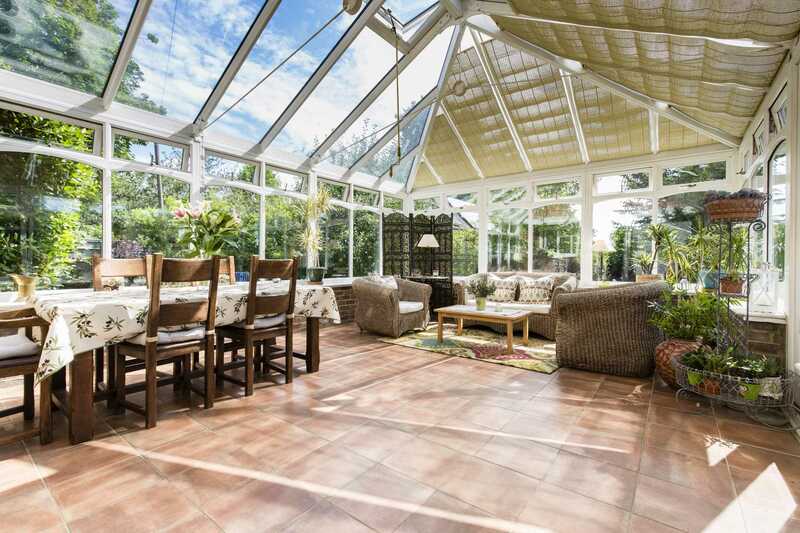 Conservatory: 21`5 x 14`8` Front aspect double glazed French doors giving access to the garden, front, side and rear double-glazed wrap around windows with ceiling windows, some with blinds, tiled flooring and fitted storage cupboard. 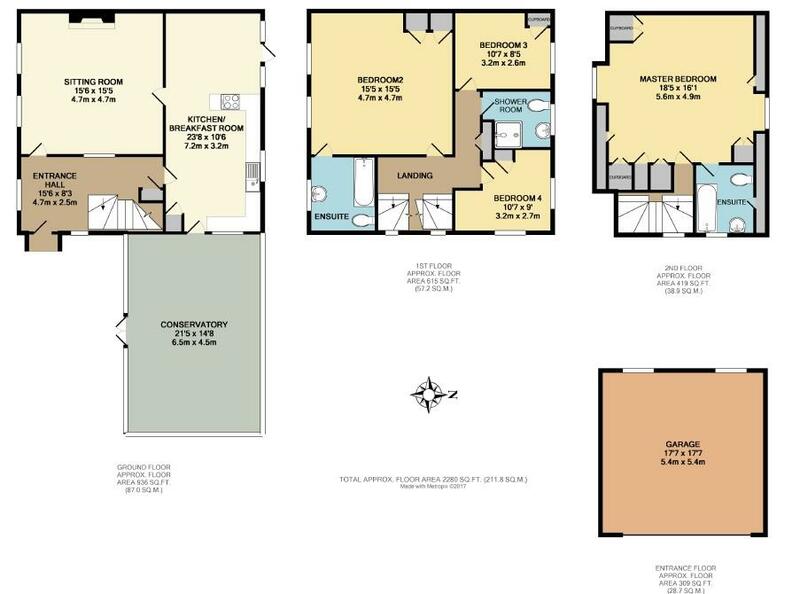 En-suite: front aspect leaded window, double ended roll top bath with claw feet and hand-held shower attachment, vanity unit with wash hand basin and mixer tap over and cupboards and open shelving under, concealed cistern WC, laminate flooring, part tiled walls and radiator. Bedroom 3: 10`7 x 8`5` rear aspect leaded window, fitted wardrobe with hanging rail and shelf and radiator. 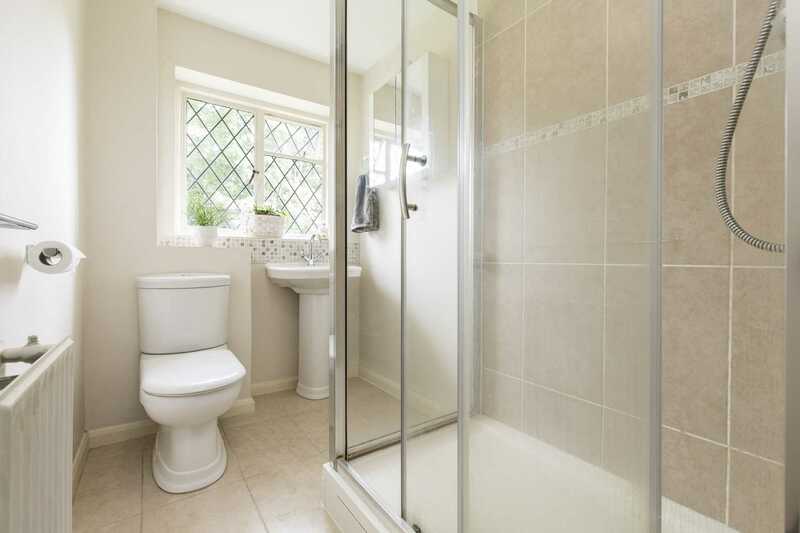 Shower Room: rear aspect leaded window, walk in shower cubicle with hand held shower attachment and wall mounted shower, pedestal wash hand basin with mixer tap over, low level WC, tiled flooring, part tiled walls and radiator. 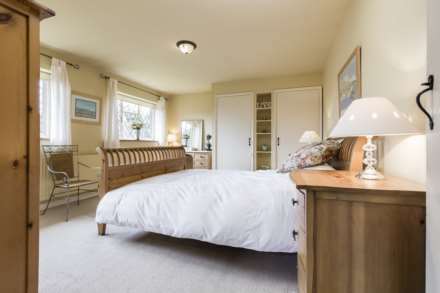 Bedroom 4: 10`7 x 9` Double aspect side and rear leaded windows overlooking the gardens, fitted cupboard with hanging rail and shelf and radiator. 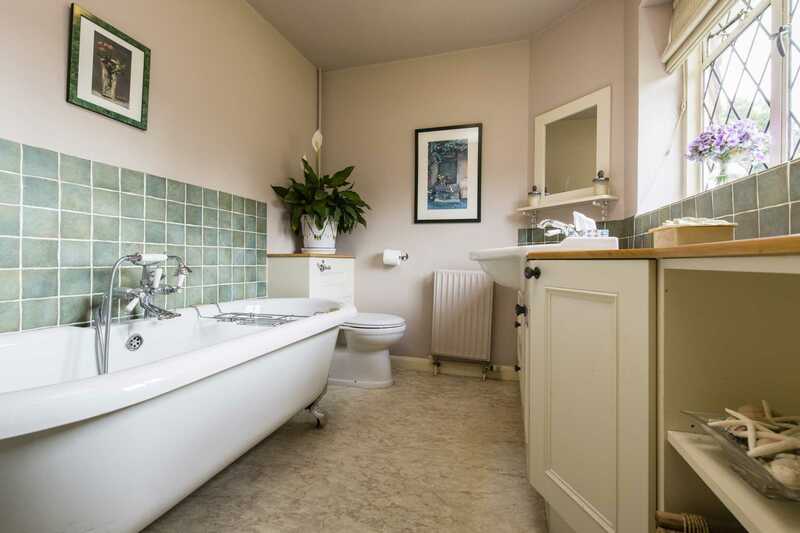 En-suite: side aspect leaded window, shower bath with wall mounted shower, vanity unit with wash hand basin with mixer tap over and cupboards under, part tiled walls, laminate flooring, concealed cistern WC, heated towel rail and eaves storage. 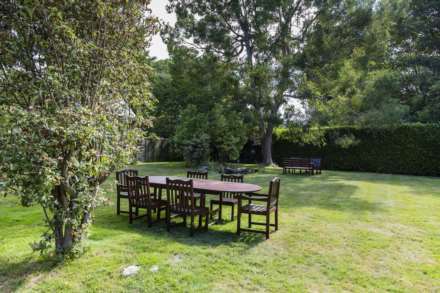 Outside: The house is approached via a shared gravel driveway leading to a private area with parking for several cars and a double garage with an up and over door, electricity and lighting. There is a pretty lawned cottage garden to the front with perimeter lavender borders to the left and wooden gates and high hedging to the right. A gravel pathway screened by the front hedge leads to the side of the house with stone steps rising to the home`s canopied porch and front door. 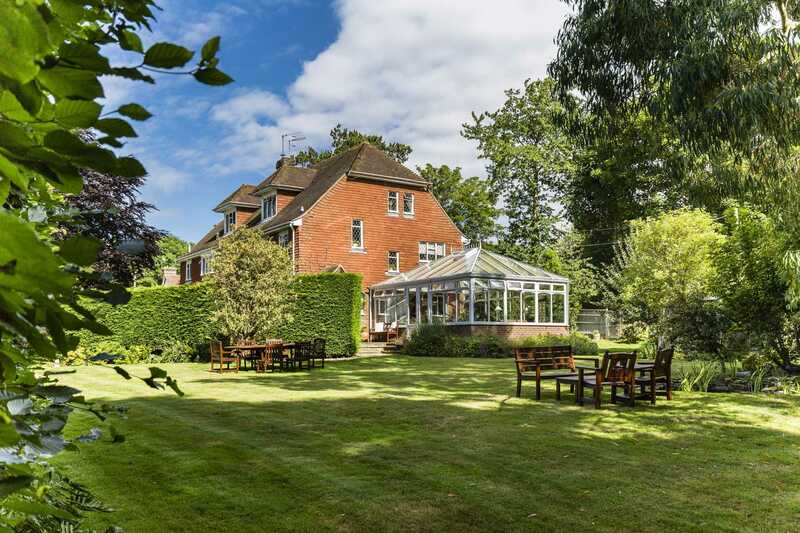 Flowers frame the low exterior of the conservatory with the side and rear garden laid mainly to lawn with a graveled area at the rear of the kitchen/breakfast room and a wooden gate at the rear. There is plenty of room for garden furniture with a pond, mature trees, hedging, shrubs, flower beds and wooden fencing bordering the perimeter of the garden. 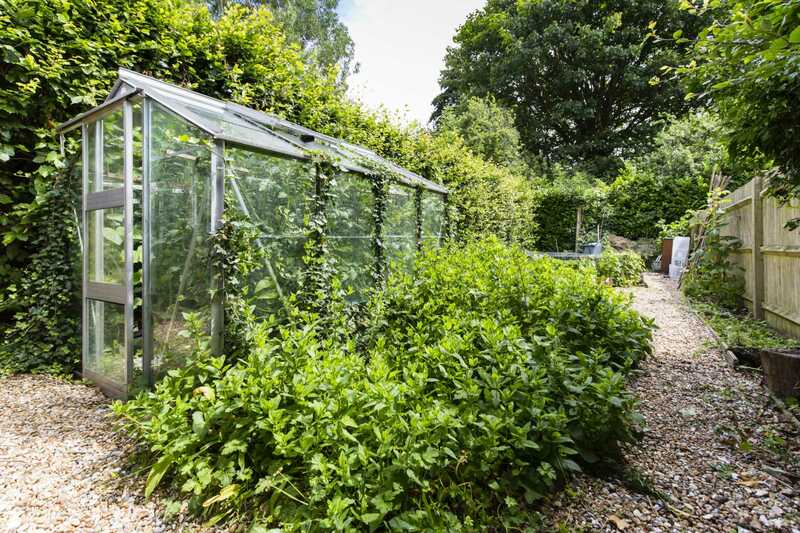 Behind the garage and screened by high hedging is a large vegetable garden with greenhouse.